Since today is the last (LAST!) day of August, I figured I should catch up on my "monthly commitments"
This month for the Stash Bee, Jennifer requested round log cabin blocks in rainbow colors. I made her one aqua block and one true blue block since no one had made any in either of those colors yet! I can't wait to see all of her blocks together! And here are all my little gooses! Now I only have to wait a few more days for the September directions! In other news, I have a LOT of baby quilts to make -- I had to make a list! 1. September -- this one I am waiting until the baby is born so I can make a boy or girl quilt. 2 & 3. December -- two friends from church are due two days in a row. One is a boy, one is TBA. I'm going to get started on the one that is for sure a boy soon! 4. March -- they're finding out the gender, but not until October since they JUST told me this weekend that they are expecting. At least I have lots of reasons to quilt, right? It only took three years. but this quilt is finally finished! You can check out finish #1 and finish #2 from this week too! Click here for all of the posts on this project! This is my first and only Christmas quilt! This quilt has been three years in the making and I finished the top over a year ago! This is the problem when your preferred long arm quilter is in Michigan! The border has a leafy vine and the blocks have a scroll work pattern in each block! I am so happy with how this one turned out! The border is one of the larger scale prints from the line and the backing is one of the green smaller scale prints. I also used the backing fabric for the binding -- it gives a great green pop around the outside of the red border! The fabric is Blitzen by Basic Grey and the pattern is Basketcase by Cluck, Cluck, Sew! 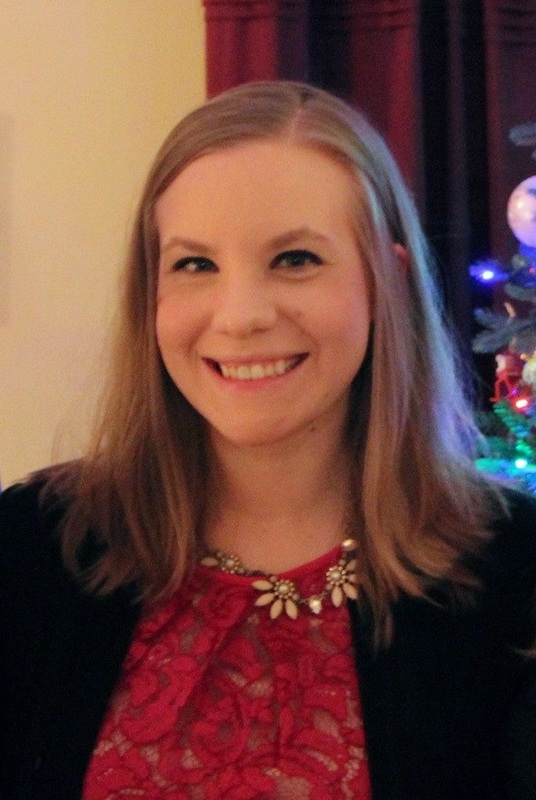 Sharing over at Finish it up Friday! This is post #2 of a three finish week! Check out #1 here! When last I posted about this project, I had decided that my turkey wall hanging for November needed some leaves in the corners of the top. I went all out on quilting this one. Each part of the turkey was done with a different style of FMQ. The turkey's snood (the red part -- I had to look up the real name, I always just call it a gobbler) is overlapping wavy lines (like in this wall hanging). The turkey head and neck is upside down clamshells to make it look like feathers. The leftmost feather is a spikey feather frond. The middle left feather is overlapping straight crosshatching. The center feather (which you can't hardly see the quilting on) is spindly swirls. The middle right feather is a swirly wood grain pattern. The far right feather is a traditional feather frond. The rest of the quilt is a large meander. I did all of the turkey quilting in brown thread and the meander in the background with off white thread on the front and brown thread on the back. In this picture of the back you can see some of the quilting on the center feather better. And this one shows the wood grain pattern feather. I used the same brown fabric from the backing (left over from this quilt) to bind it. This one turned out so cute! Mr. Turkey probably needs a little button eye before November too. Here's the back with my hanging pockets. Come back Friday for Finish #3! Sharing this finish at Free Motion Mavericks! I am so excited because this week I have THREE finishes to share with you!!! I quilted each section with a different pattern: the cat is squiggles. The frog is loop-de-loops and the hat has overlapping loops. The candy corn have different sizes of loops. The purple candy has a swirl. I am so happy with how this turns out and I hope my partner loves it! It went off in the mail today with some fun goodies! Michele made me a lovely wall hanging that will be perfect for my office at work! It is so detailed! She also sent me a great fabric basket, a magnetic pin dish and a candle! Thank you! Sharing at the normal Tuesday places: Fabric Tuesday, Linky Tuesday, Sew Cute Tuesday. I realized that the black background was limiting with what I wanted to do, so I ripped that apart and found a different background entirely. I am so in love with how this turned out! My partner said she liked animals, so I thought a frog and black cat were perfect! Doesn't the texture background look so much better than the black?? The cat pattern I found here and modified it slightly -- no side pieces and made the tail skinnier so it ended up 8" instead of 8.5". The wrapped candy is two QSTs and a plain square! Now let's talk about this frog. I searched and searched for a cute frog pattern. And then I had a CRAZY idea. For those of you that get Quiltmaker magazine, this issue's Patch Pal is a frog. I took that pattern and miniaturized it. Each square in the pattern became 1/2 inch finished in my frog. I did eliminate the feet and tongue from the pattern because I'm not THAT crazy. Now I just need to do some hand embellishment -- whiskers and eyes for my kitty and a mouth and eyes for my frog/witch. Linking up at Linky Tuesday, Fabric Tuesday, Sew Cute Tuesday, and WIP Wednesday! We have a new pattern available on Etsy!! Say hello to Shadow Boxes! Update: I used this pattern in September 2017 to make my own version of this quilt with the Bonsai fabric line from Island Batik. This pattern is a great option for your large scale prints! This queen sized quilt turns out 92 inches square. Don't forget that you can get your solids and extra wide backing from us on Etsy! 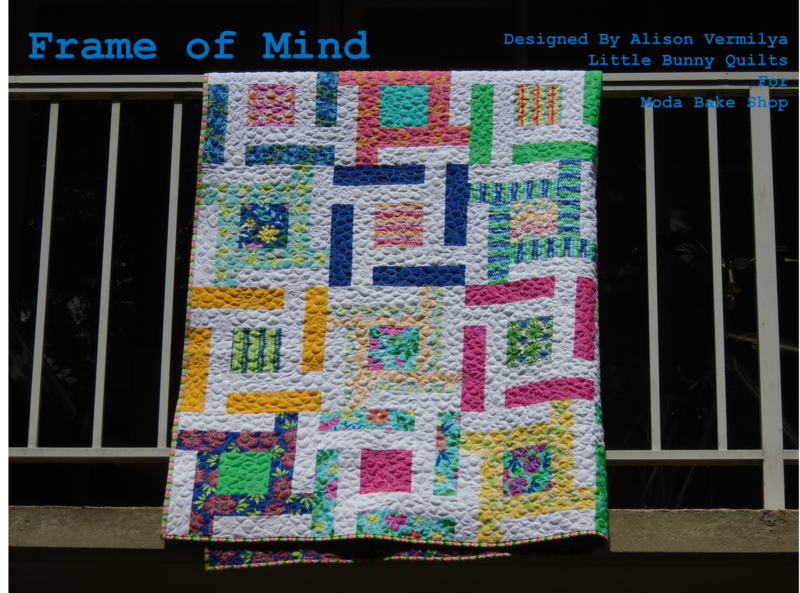 Frame of Mind Moda Bake Shop Quilt! 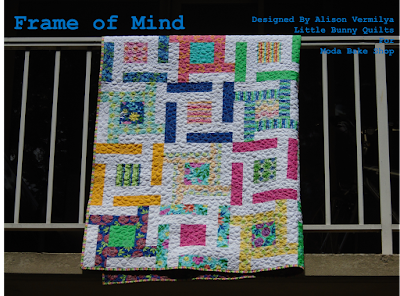 I am so excited to FINALLY share my finished quilt for Moda Bake Shop -- Frame of Mind! I submitted this design way back in June and got the fabric over 4th of July weekend and got right to work! Although, I did finish it juuuust under the wire, but that's the thrill, I guess! I was able to use Stephanie Ryan's new line, Good Karma and I loved every minute of this process! This is a one block quilt great for confident beginners -- all squares and rectangles and minimal seam matching! It does use partial seams, but one you make a few, you get the process down pat! You get two different block looks with the two different arrangements of your background and print strips. Alternating your block As and block Bs gives you a great final look! For the binding I used one of the ziggy stripe prints (and I apologize for not having a gratuitous binding shot!) and it turned out AWESOME. This quilt ends up 75 inches square! Pop on over to MBS for the full tutorial! Sharing at Finish it up Friday! Since I actually got my August wall hanging done before the end of August (wahoo!) I started working ahead on the upcoming months. I have October done, but September, November, and December are not. I had the backgrounds all sewn together for November and December, so I cut squares and formulated a plan for September, but haven't sewn anything together for that one. So while my mom was here and we were sitting around chatting, I got all of my fusible applique pieces cut and ironed on to my backgrounds. The turkey took BIG pieces and I had a hard time finding pieces big enough! I think he's pretty cute though. I wasn't sure if I should add anything to the border or not, so I went ahead and did all of my turkey satin stitching and I think now I am just going to add some leaves in each corner. The outer squares on this one are pretty enough on their own, but just the turkey seems a little stark. And then I made my Christmas tree! 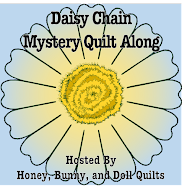 Linking up at Linky Tuesday, Sew Cute Tuesday, Fabric Tuesday! Hello! I am back! Hopefully my secret sewing will be revealed very soon, but in the mean time, I have lots of progress on other projects to share! This past weekend was the biannual quilt show put on by the Four Counties Quilt Guild. My mom was in town until yesterday and on Saturday we went off to the quilt show. Here are a few of my favorites! This elephant is made up of all florals! A stitched feathered star -- that's all stitching and very little fabric! And last but not least -- a Swoon! 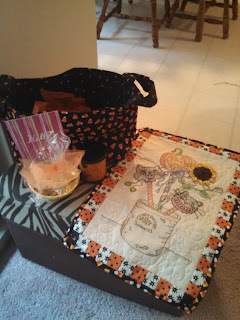 Of course, all this did was lengthen my quilt bucket list and number of FMQ motifs I want to try! Be back tomorrow with some real quilt progress!